FS702 cures to give a firm but flexible fire seal. Suitable for use in various construction movement joints up to 15%, whilst providing an excellent acoustic and air seal. FS702 is ideally suited for use around small annular service penetration seals in walls and floors. It can also be used for the bonding and pointing of joints and service penetrations in conjunction with Nullifire FB750 coated boards. 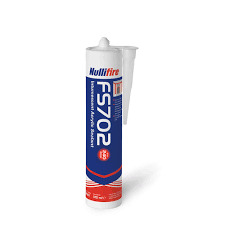 FS702 is suitable in low movement fire rated joints to seal between joints in FB750 fire rated coated batts, substrate to penetration service applications and pointing up of penetration seals. FS702 sealant may be used to provide a linear joint or gap seal with specific supporting constructions and substrates and as a penetration seal.